I was set to make this kuih for the MFF event after so many people raved about it. Apparently, in Terengganu (a state in Malaysia) kuih akok is smooth looking as they use a higher ratio of flour to eggs whereas their neighbor, Kelantan uses more eggs compared to flour. When a batter has more eggs than flour, the kuih will puff up and then it will shrink upon hitting the cool air hence, the kedut / wrinkly in the name. This kuih is pretty similar to Yorkshire pudding where the kuih will puff up and even the taste is a bit like Yorkshire putting too except that this is the sweet version. As there is quite a substantial amount of eggs in it, the bottom part of the kuih is almost custardy. So, do I like this kuih? I wouldn't sing lyrical on how fantastic this kuih is but it’s a nice enough kuih but not that nice for me to go and hunt for it. I've never eaten a curry that tastes quite like this before. The taste is absolutely unique, so don't let the word 'curry' in the title of this recipe fool you. It does not smell or even taste of curry.. not at all! Despite the amount of the dried chilies used, there is not much heat (spicy) to it and thus, this dish is quite kid friendly. There's a hint of sweetness from the coriander seeds used (not sure how to explain this but somehow the coriander actually mellows the rest of the spices) and gives this dish a delicate feel. If you are not a fan of fiery curries, this dish would be perfect and even if you are a fan of fiery curries, do give this a try. As I was only cooking for two and I do not like to keep hard boiled eggs overnight as they always give me stomach ache ( and also hard boiled eggs don't freeze well ), I only used 5 hard boiled eggs and I reduced the rest of the ingredients by half. The recipe given here is a full recipe by Betty Saw. Sweet potato or Ubi Keledek, in Malay, is a very versatile tuber. The shoots and tuber can be eaten as a vegetable and also be used in sweet and savory dishes. There are a few types of sweet potatoes here and the most common ones are the orange and the light yellow ones. We do get the purple variety here but they are very expensive. It cost around $2.00 a pound. I actually like the orange kind as they are much sweeter but it is not good for making kuih like this. It has way too much water content in it so I will usually add some light yellow variety to it. Cek Mek Molek (which means "Beautiful Lady") is a traditional Kelantan Kuih and is very similar to Kuih Keria except that this kuih has the sugar on the inside instead of the sugar coating on the outside. I understand you can find savory cek mek molek too in Kelantan where they put serunding daging it. This is the first time I am making this kuih and I just made a few as Carlos is not a fan of sweet potato. As for the recipe it is just estimation as different sweet potato will yield different results. I have always felt that without Solok Lada as one of the accompaniment for Nasi kerabu, the meal is incomplete. I've often found whenever I have bought Nasi Kerabu, the seller would not make Solok Lada because not many people like to eat it, and if they do, they don't make much and it sells out very quickly. This time when I made Nasi kerabu , I made sure I included Solok Lada and I was surprised at just how easy it was to prepare. 1. Slit chilies lengthways with a sharp knife for stuffing. Carefully remove seeds and membranes. Soak in water for 15 minutes. 2. Into a blender (processor), put fish cubes, grated coconut and shallots. Blend until fine, and then stir in sugar and salt. Mix well. 3. Stuff each chili with 1 tbsp of fish mixture. Into a pot, put stuffed chilies, slit side up. Then, carefully pour in coconut milk mixed with a pinch of salt. 4. Cover pot and simmer gently for 15 minutes or until cooked and almost dry. 5. Serve with either rice or Nasi kerabu. 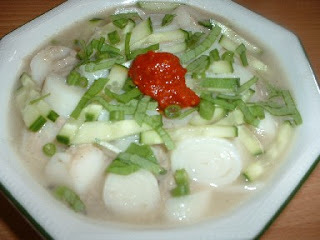 I am submitting this post to Malaysian Food Fest, Kelantan Month hosted by My Kitchen Snippets. When I went through the ingredients of this dish, it is simple enough for me to do it. I have no clue how this dish look like as there is no picture of it from Betty Saw’s cookbook but I am brave enough to try it out. I am a person who normally likes to try out a recipe base on the picture of the dish. The method of cooking is very much like serunding as you have to boiled the meat first and then stir fry it for a few hours until it gets really dry. Since I like serunding I like this dish as well except I wish it is much spicier. If I am cooking this again I will add more chili to it. This dish goes well with rice, bread or just serves as appetizer. Betty Saw said this dish can be stored for a couple of weeks but I would advise to put them the fridge. Kuih Tahi Itik (duck’s dropping cake) is very popular in The East Coast of Malaysia especially in Kelantan, my opinion not because of its taste, but probably because of its notorious name. In the olden days, it was more economic for people to raise ducks for their eggs rather than chickens because duck eggs are so much larger, and some say with a better flavor. Chickens were raised more for their meat to feed the family. So traditionally, people used duck eggs for their baking, not chicken. When making Kuih Jala Emas (Golden Net Cake) and Kuih Pauh Di Layang (Cut Mango Cake) which uses only the duck egg yolks, there would always be unused egg whites. So it's inevitable Kuih Tahi Itik would also be made. If you make these two kuihs, you must make the other, kind of like 'The Three Musketeers' of the Kuih world. Since this Kuih Tahi Itik is made from this 'by-product' (egg white diet wasn't in fashion then so no one gave a toss to worry about high calories, fat and cholesterol), it derives its name Tahi, which is also a 'by-product'. The appearance of the Kuih doesn't help either as it does resemble duck's droppings, whitish in color and in clumps. Trust the olden day people to have such a sick sense of humor... lol. Another theory of mine ( please don't quote me on this ) as to why this kuih is named as such, is because when you stir the kuih, the mixture will take a greenish hue from the pandan leaves which makes you even more aware of how close the color is to duck's droppings! From greenish in color to whitish and in clumps! Just as its namesake looks! I guess you spread it on toast but I much prefer to have it as it is. The shape of my Kuih Tahi Itik is not traditional... for my sake purely! I don't think I can bear eating something that looks vaguely like its name. I have also reduced the amount of sugar but in my opinion, you can reduce it even more if you prefer. 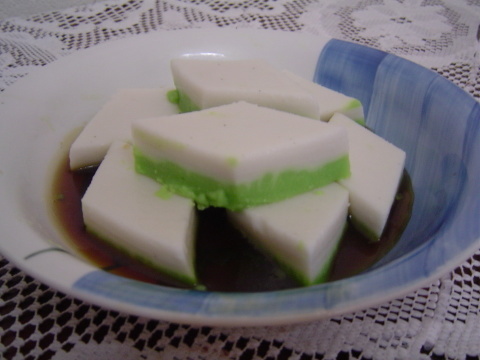 I have always wondered about this Kuih Tahi Itik, now I wonder no more. Like I mentioned previously I have never been to Kelantan but I am very curious about the state and I have been asking my sisters and friends about the state and its food. A friend of mine visited it in mid 1990’s and she was not impressed with it as it wasn’t as well developed as the other states in Malaysia. My family has a housing project there now and my sisters have been flying there once a week. They told me Kelantan is no longer that sorry state. In fact, it has grown so much over the short years that one could hardly recognize certain areas as there was so much development. My friend Shereen’s been there too and she don’t exactly remember much about the place but the one thing that she can't forget was the delicious lingering smell of smoked squid all over the city. It seemed every street had a hawker fanning charcoal in a makeshift barbeque pit smoking dried squid beside the road. She said once you had the first taste, you’ll be hooked. I saw this recipe on Betty Saw’s cookbook and I since have some shredded Chinese style dry squid I thought I give this recipe a go. Being so far away from home, I make do with what I can find here but if you are in Malaysia, you can easily find the prepared shredded cuttlefish sold in packets all over Kelantan and Terengganu state. In fact, I am pretty sure that you can even find it in your local supermarket nowadays. I also did not use green mango as I can't find any at the Asian grocery. I've used not quite ripe Mexico mango and I think that it tastes even better from the sweetish and not too sour flesh. Feel free to adapt the recipe to your liking. There is no right or wrong in replicating a recipe as long as you follow the basic. Let’s take a break from MFF Event today and feature this chicken kebab. This is one dish that you can prepare the night before and grill it the very next day. It will become handy if you want to entertain a large number of guests. Marinating the chicken overnight allows the yogurt to tenderize the chicken and also it won’t dries out when you grill it. I just marinate it with whatever spices I can find in my pantry and served them with some tomato salad but you can have it with bread or even rice. This is my 4th dish for the MFF – state of Kelantan event. I’ve made ayam percik before but it is a bit different from Kelantan. That ayam percik had chili and more spieces in it but not this one, that is why the sauce on top is white in color. The taste of this percik is rather mild as I like certain food of mine to be spicy. Going through quite a few recipes when preparing for this event I notice some of Kelantan food is not as spicy as other states. Anyway, this dish will be great if you have kids who don’t take spicy food. I am sure they are going to enjoy it. I would say that Bubur Campur Kelantan is a little bit alike to Bubur Cha Cha, another popular sweet dessert amongst the southern states in Malaysia. There's the coconut milk, the sweet potatoes and the yam and despite the use of white wheat and bananas, the taste is actually pretty similar. In Kelantan, many actually even add in tapioca to this sweet dessert and if you do have some, just add them in. Nothing beats a nice sweet dessert, served hot or cold at the end of a meal. I was pretty excited to try out this recipe from Betty Saw's The Complete Malaysian Cook Book as the name is really intriguing. According to Kamus Minerva, 'keremak' means various plants whereas Wikipedia describe it as the name of a plant. That to me is of no help whatsoever to clarify the meaning or help explained as to why this recipe is called as such. There were no plant or plants harmed in the making of this dish. If you take a look at the various ingredients used in this recipe, none fit the bill. It was only once halfway through cooking the dish, it finally dawned on me why the name is 'keremak'. Read on, all will be revealed. After that accidental discovery, I was even more stoked to hurry up and cook the dish. I made sure I read the recipe carefully and all was dandy. The bubbling dish looked kind of familiar and it even smelled familiar. Then I tasted it and it finally dawned on me why the dish is called 'keremak'. It is the Ayam Masak Korma! Get it?.. 'keremak' and 'korma', one and the same, what an anti- climax! For those of you who are not familiar with Malaysia, each and every state in Malaysia has their own lingo / dialect. So, perhaps, what is 'korma' to the rest of Malaysia, is 'keremak' to the Kelantanese. Saying this, this 'Ayam Masak Keremak' is no less delicious than the usual 'korma' that you and I are familiar with. The only difference is this kelantanese version has a thicker and more aromatic gravy than our somewhat anemic and boring looking 'korma'. Nasi Kerabu happens to be my most favorite rice dish ever. I have this ex-colleague of mine name Jeff who used to live in Kampung Baru and I will get him to tapau (take out) for me every week. I've always wanted to make nasi kerabu but when I look at the long list of ingredients and the amount of afford putting into making a dish I tend to forgo it. Being overseas doesn’t help either as it can be quite difficult for me to get some of the ingredients but because of this MFF event I don't mind spending a few hours in the kitchen to cooked this meal as it is all worth it. The meal turns out great. One of the key ingredients in Nasi Kerabu is the fish, specifically Mackerel. I was so confident I could head down to the Asian supermarket and buy some Mackerel, little did I know there is no such thing as a simple Mackeral here in the USA! I was confronted with Atlantic Mackeral, Pacific Mackerel, Indian Mackerel etc. I had no idea which one to buy as none looked familiar to me as they were huge..almost as long as my arm, I kid you not! The fish that I'm familiar with that normally accompanies my Nasi kerabu were all cute looking and petite. That’s just the first problem I faced. The second problem was that I could not find any budu (salted / fermented anchovy sauce). Nasi kerabu without budu is like Nasi Lemak without the Sambal or teh Tarik without the froth. You can do it but it's just not the same. These all changed when my good friend gave me half a bottle of budu brought all the way back from Terengganu. I just had to make this Nasi Kerabu by hook or by crook. No more excuses! 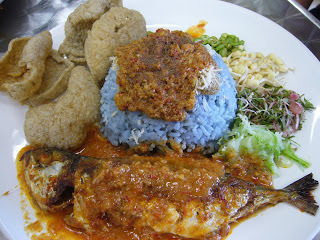 Not many people know that Nasi Kerabu comes in a few colors other than blue although blue is the most popular color. Variations can be white (normal white rice), yellow (turmeric and cekur / sand ginger) which is called Nasi Kerabu Tumis and grey (from Mengkudu leaves / noni / Morinda Citrifolia ) which is known as Nasi Kerabu Hitam although blue is also known by the same name. In reality, there are so many different combinations of accompaniments and styles of cooking that it is quite impossible to list them all here. If you are interested, remember 'Google' is your best friend. I am sure most of you have seen Malaysian Food Fest events going on for the past few months and now it is my turn to do the state of Kelantan. By the way, do drop by to Annielicious Food to check out the round up for Johor state. I’ve participate quite a few of blog events hosted by fellow food bloggers throughout the years of blogging but never hosted one until now. When Wendy of Table for 2.. or more told me about her plan to do it and asked me if am interested to host for one of the states, I told her I am all for it. There were quite a few states not taken up by anyone and I choose to host the state of Kelantan. I am not from Kelantan or even been to Kelantan but I am always curious about this colorful state. Hopefully, I get to visit the beautiful state of Kelantan one day. Kelantan is a state of Malaysia. The capital and royal seat is Kota Bharu. The Arabic honorific of the state is Darul Naim, ("The Blissful Abode"). Kelantan is positioned in the north-east of Peninsular Malaysia. It is bordered by Narathiwat Province of Thailand to the north, Terengganu to the south-east, Perak to the west, and Pahang to the south. To the north-east of Kelantan is the South China Sea. Kelantan is located in the north-eastern corner of the peninsula, Kelantan, which is said to translate as the "Land of Lightning" (see alternate theories below), is an agrarian state with lush paddy fields, rustic fishing villages and casuarina-lined beaches. Kelantan is home to some of the most ancient archaeological discoveries in Malaysia, including several prehistoric aboriginal settlements. Due to Kelantan's relative isolation and largely rural lifestyle, Kelantanese culture differs somewhat from Malay culture in the rest of the peninsula; this is reflected in the cuisine, arts, and the peculiar Kelantanese Malay dialect, which is unintelligible even for some speakers of standard Malay. Kelantan Darul Naim is famous it unique culture. 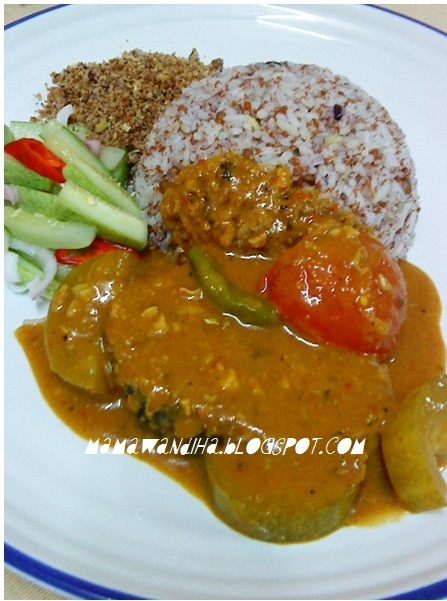 The Kelantanese cuisine, heavily influenced by Thai cuisine, is quite popular among Malaysians. The key ingredients are rice, coconut milk, sugar, brown sugar, local ulam, blue pea flower, galangal and pickle garlic. Hence, the curries are richer and creamier in taste. Most Kelantanese dishes are sweet as the use of sugar is a must in the kitchen. Besides sugar, coconut milk is used more than anywhere else in the country. Even their savoury dishes carry a tinge of sweetness. Kelantan's fish soup, singgang ikan is lightly seasoned with palm sugar and so, you can imagine the taste. And Kelantan's Ayam Percik is on the sweet side too, rather different from the versions of other states. But that's how the locals eat, that is their way. Kelantan and Terengganu are neighbours. They share a lot of similarities but yet... are different in many ways. They both have nasi dagang, but they are not the same. Kelantan's version is made with the red specked beras lembut which gives it a tender texture while Terenganu's version is all white and chewy with a mixture of glutinous rice and medium grain rice. Singgang ikan is also available in both states, but the major difference lies in the colour. Terengganu's version uses turmeric and it's yellow, while Kelantan's version is beige due to the use of palm sugar to give it a sweet end. 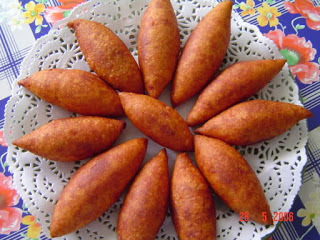 Both states have Akok too, but Kelantan's version uses palm sugar, less flour, and thus looks brown and wrinkled. Try looking at these two pictures (Kelantan Lompat Tikam, Terengganu Lompat Tikam), you will see how different the lompat tikams are. Well, if you've been to both states before you will notice that both states speak in different ways, what more about the food. This rice dish is a regional specialty from Kelantan and sometimes the rice is tinted in blue with blue pea (bunga telang) flower. It is cooked with many types of herbs. Besides that, there are many fresh herbs like daun kesum (Vietnamese mint) bunga kantan (torch ginger), mint leaves and etc. Other ingredients like sliced onion, cucumber, bean sprout, fish floss and fish crackers are added to the dish to make it a complete meal by itself. This is another rice dish which is made from glutinous rice which is cooked in coconut milk, blended onions, garlic and spices like fenugreek. It is a well known breakfast food on the East coast of Peninsular Malaysia such as Kelantan and Terengganu. Nasi Dagang can be considered as a festive dish in Kelantan as it is prepared for Hari Raya/Eid Al-Fitr. It usually served with fish curry, salad, hard boiled eggs. Ikan Tongkol (Tuna fish) is the standard choice of fish but other fish such as mackerel can be use too. Nasi tumpang is basically a Kelantanese snack, sold around Rm1.00 a packet. It is very similar to Nasi Lemak except that Nasi Tumpang is white rice pressed into a cone shape, layered with Kelantanese Serunding Daging and gulai lemak ikan tenggiri (Spanish Mackerel) and then wrapped with banana leaf. It is very similar to Nasi Uduk from Indonesia. Laksam is flat rice noodles, served with coconut milk gravy cooked with finely blended fish (ikan selayang), shrimp paste and garnished with raw vegetables like shredded cucumber, long beans, bean sprout and cabbage. It is serve during breakfast but you can still have it anytime of the day. 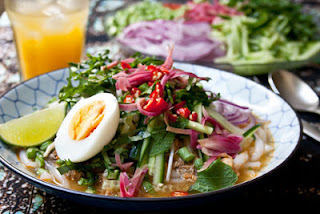 Laksa Kelantan also known as laksa putih (literally translates as white laksa for the pale appearance of the broth. The broth or gravy is cooked with fish, coconut milk and load of spices. It is served with ulam (local salad). 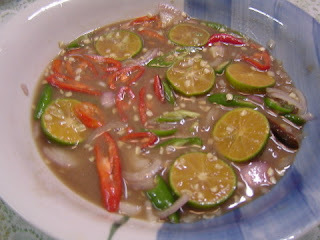 Budu, a fermented anchovy sauce that is used as flavoring with added chili, onion, lemon juice and usually eaten with rice, fried fish or Ulam (assortment of herbs) such as long beans and pucuk paku (fiddlehead fern). The salty and sourish taste can get very addictive. Somtam is one of the famous Thai dishes in Kelantan. It is widely available in this region which has large number of ethnic Thais. Somtam is a papaya salad with a salty, sweet, spicy and sour taste. The ingredients in this dish are young shredded papaya, tomatoes, dried shrimps, chilies, soy sauce, ground peanuts, fish sauce and lime juice. 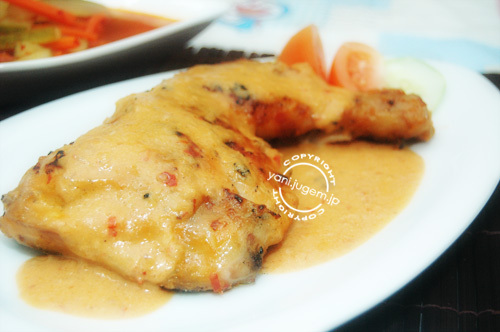 This popular dish in Kelantan is broiled chicken dressed in sweet coconut gravy. This dish is usually eaten with white rice and dipped into cholek (dipping sauce) and this case Thai Chili Sauce is usually used. 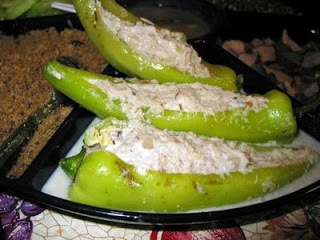 This dish is green or red chili stuffed with grated coconut, fish fillet and cook in coconut milk. It is usually serve with Nasi Kerabu. Ketupat Sotong Kelantan is made by stuffing glutinous rice into the calamari and cooked in brown sugar sauce. Now let’s talk about the kuih. Their kuih here are heavily influenced by the Thai Dessert. Most of their desserts are made from coconut milk which is plenty in Malaysia. They have many types of kuih which some I have not even seen or taste before. What I found interesting about Kelantanese kuih compared to those from other Malaysian states, other than the well known creativeness and innovativeness, is the use of a lot of eggs and sugar. to the extent that there are more of eggs and sugar than any other ingredients. It is made from duck egg yolks and sugar. It is very sweet like most of the Kelantanese kuih or dessert and is also known as the Royal Kelantan Food. 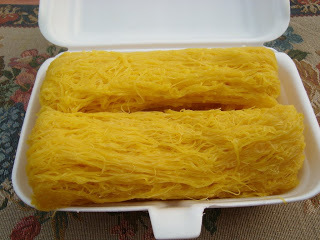 This dessert or kuih looks like fine gold threads. 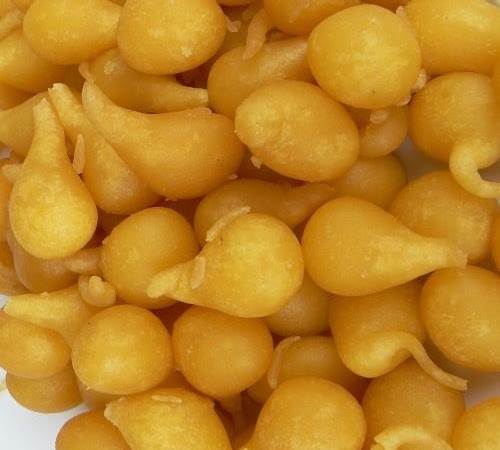 Made from duck egg yolks which gives it the golden yellow color and then soaked in syrup. Cek Mek Molek can be translated as pretty lady in Kelantanese dialect, it is a fried mashed sweet potato with sugar filling in it. 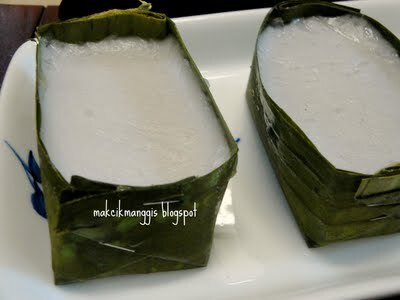 Tepung Pelita is made from rice flour, coconut milk and sugar, encased in banana leaf. It has two layers, top layer is white in color and the bottom layer is green in color. Buah peria resemble peria katak (a smaller variety of bitter gourd) They are made into many colors with mung bean cook in palm sugar as the filling. 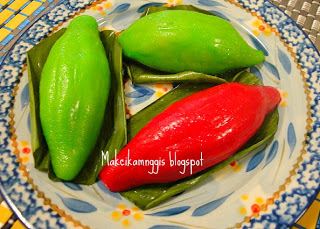 It is very much like the Chinese Angku Kuih. Sira labu is pumpkin cooked in palm sugar. It is traditionally served during special occasions such as wedding ceremony. There are many more Kelantan dishes out there. Just click on some of the links I've provided here and they do have other Kelantanese dishes in their blog. Hopefully, many people will try to cook some Kelantanese dishes and I am looking forward to all your entries. 1. Who can join? Anyone can join. Come let's replicate some Kelantan Food at home! 2. Prepare a dish (sweet or savory) that is from Kelantan, be it old time favorite, modern dishes or dishes that has been localized. Chinese or Malay or Indians cuisines. All are welcomed. Take a picture of the food or many pictures. If possible, tell us the story about the dish, share with everybody so that others will learn. 3. Provide a recipe that is credited (from books, internet, friends or family or maybe it is from your own) Submissions without stating recipe souces will be accepted. 4. Submit your entry latest by 30th April 2013 except for Facebook submissions. c. Include this caption below your blogpost "I am submitting this post to Malaysian Food Fest, Kelantan Month hosted by Gertrude of My Kitchen Snippets (link back to this post" Send the following information to this email address snwann@gmail.com with the email subject as " MFF Kelantan"
A Round Up will be done for all blog entries and emailed in entries on 1st May 2013. Facebook entries wil not be included in the round up.